Let's go.. INTO THE FUTURE!! We bounce around a ton of ideas around here for expansion packs, but I can think of very few that generated the amount of excitement as the idea for time travel. When I say “time travel,” I’m not just talking about new technology and a new way of life in a futuristic setting—though that’s a big part of it—but also about giving you the ability to travel to the future and back again, with your actions in the present having repercussions in the future. We knew it was going to be a challenge to work out the gameplay mechanics to achieve this, but that was one of the things we were most excited about. 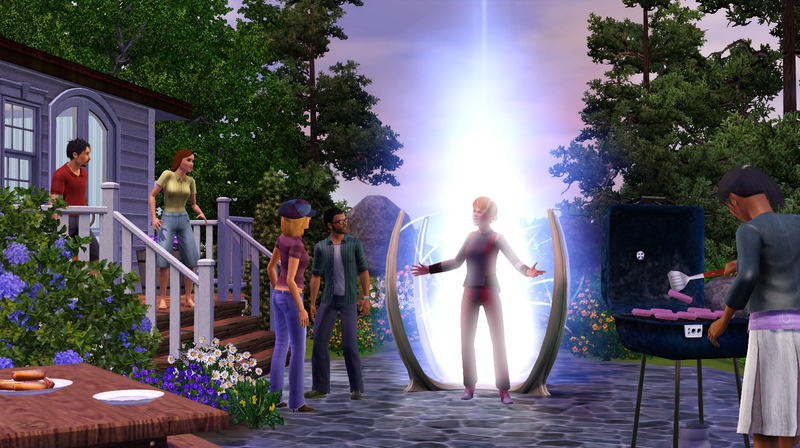 In The Sims 3 Into the Future your Sims accomplish their time hopping by entering the Time Portal. First we knew we had to make the new future setting compelling. We set out to build a whole new world hundreds of years from now, a world that not only looks different but that is populated with all-new technology, objects and interactions that will change how you play with life in surprising new ways. The game gets even more interesting once you start traveling back and forth between the future and the present. What your Sims do in the present will affect the future—will that future be a grim one or a bright one? Will your Sims have to adapt to a polluted and unstable environment, or will they walk around with aspring in their step through a love-infused wonderland where anyone is liable to break into spontaneous dance at any time? Nothing is ever completely black or white, though: meteorites that rain down in the dystopic future can leave behind gems that are a great source of income, and Sims that have to resort to eating bugs will find they can make a nutritious and tasty dish! Meanwhile, even the happy-go-luckiest of Sims in the future utopia might overdose on all the love and sunshine and end up retching rainbows! Whichever future your Sims end up with, they can meet their descendants there, then do something in the present that threatens those descendants’ very existence. 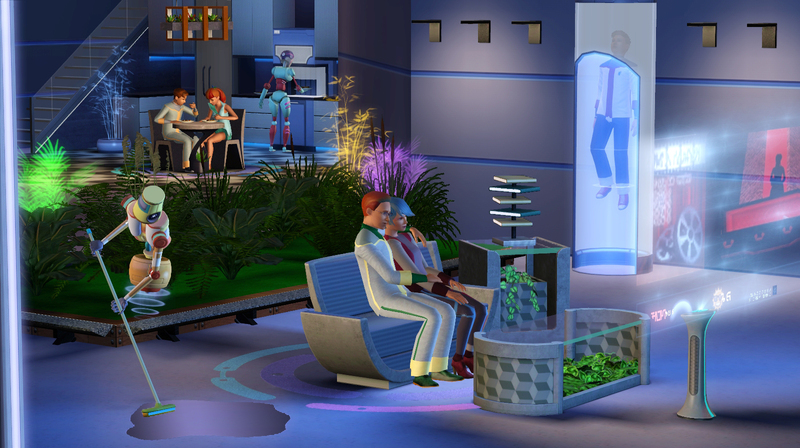 If you reduce your present-day household to a single Sim with the loner trait, for example, you might go on your next trip to the future only to find them descendant-less! 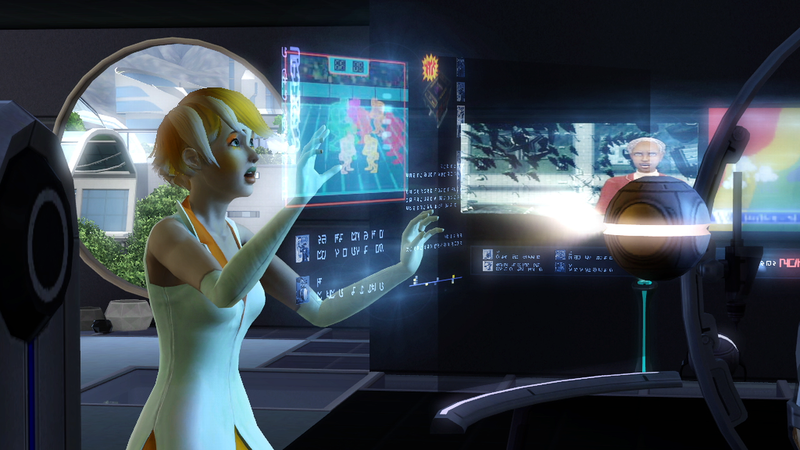 By now you’re probably wondering exactly what kind of technology your Sims will encounter on their journey to a future paradise or dystopia. I don’t want to give away everything,but here’s a sampling: hoverboard, jetpack, laser beat machine (a crazy new electronic instrument that’s part laser harp, part foot drums! ), dreampod, food synthesizer, and air tube elevator! Suffice it to say, the tech will reinvent the way your Sims eat, sleep, travel, socialize, work, and have fun. The addition of all this new tech left us free to take full advantage of what the futuristic setting has to offer in terms of opportunities for rich storytelling and exploration. This includes the new Create A Bot feature. From the beginning we knew we wanted to make Plumbots a central part of life in the future, and allow players to go deep in creating and experimenting with them. While the interface will feel familiar and comfortable to anybody who has used Create A Sim, Create A Bot includes some powerful new game play elements that will let you tell all sorts of new stories with a variety of biped and hover bots. You can hone your new bot-building skill in order to create different trait chips and program your bots’ behavior. Your bots can become friends and companions for your Sims and integrate into their lives in interesting ways as you give them not only parts to, say, help out around the home, but emotional traits as well! We definitely drew inspiration from the brilliant and imaginative ideas that we saw in our forums and can’t wait for you to get your hands on this upcoming expansion pack. So get ready to send your Sims through the Time Portal and experience life like never before with innovative new features ranging from future technology that will improve your Sims’ way of life to the ability to shape and alter the future through your Sims’ present-day actions. 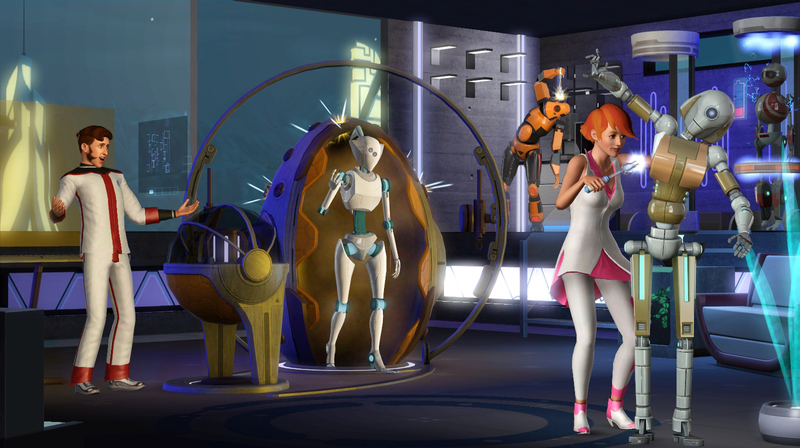 We’re very excited about what the future has in store for you and The Sims 3. 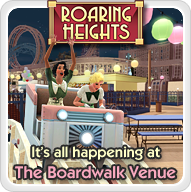 Come back soon as we unveil more about this exciting new expansion pack!